Which Photography Website to go ? Thread: Which Photography Website to go ? So many and so difficult too. As for a beginner, of course will intend to go for a free one first! Any advice from our fellow members ? Re: Which Photography Website to go ? Well Albert, quite a few of those sites you mention, and the more that are out there are designed to do different things, and some of them do different things better. So, it's probably best if you give us an idea of exactly what you're looking for in a hosting site. I personally use smugmug, but I have my own domain as well. There are two views of my galleries: Owners view which shows all of the galleries; and visitors view in which I delete some galleries from public view. However, if I so desire, I can provide a link to one of the unlisted galleries. I have barely scratched the surface of smugmug's capabilities. However, I had an external hard drive crash which might have resulted in the loss of many images except that I had the saved my best on smugmug.com. IMO, the five dollars a month is well spent. Last edited by rpcrowe; 10th January 2013 at 03:47 PM. hm..thats the problem here too. i dont know which site to focus upon..i started with facebook , have accounts in flickr , 500px , google plus.. people say google plus is a great platform for photographers but i seldom use it..dont know y people say so..any idea people? taking into consideration tat one wont get noticed without actually commenting or fav in other photos in websites such as 500px and flickr .. i made my move not to upload anything to the net for a year ( its 2 month now presently ) . 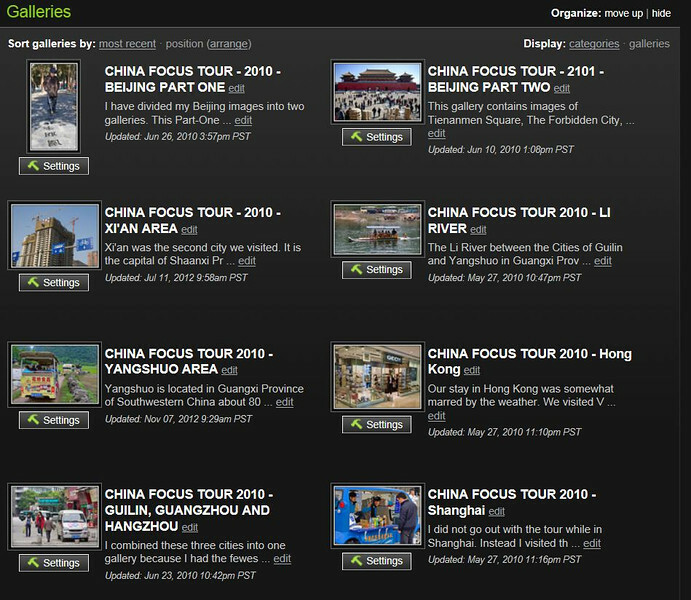 i began participating in the forums like CiC and some critique groups in flickr that could bring about improvements in photography , get me updated and know about the trends happening in the world.. I use P base which has a slight cost but less than some other sites; and, most important for me, it is so easy to use that even someone like me can upload photos and manage my galleries! There are a number of different pre made templates or you can create your own. I would suggest having a browse around other peoples photo layouts at a selection of hosting sites then see which ones make most sense to you. 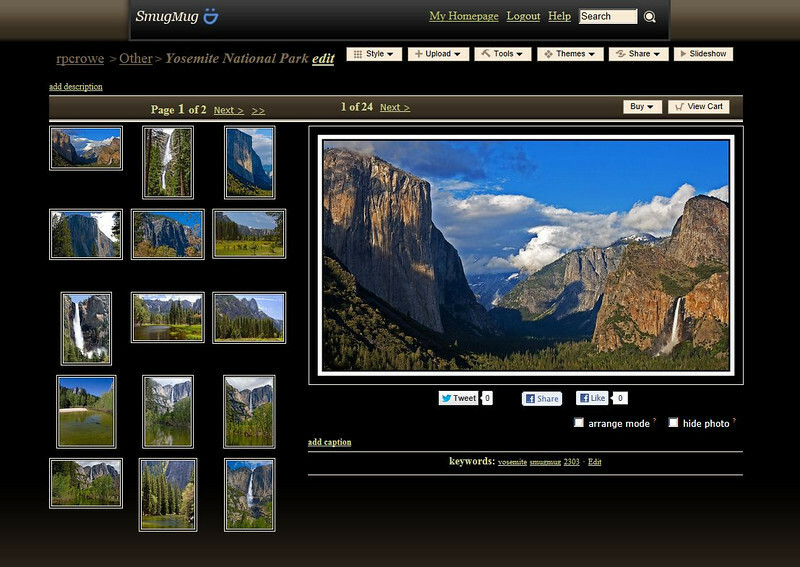 I did noticed that quite many photographers using smugmug. Richard had shown it well here too. I like it but to be honest, I know little of computer website hosting (?) so I am worry that I can't handle and manage the settings. However, will try to look into its website. I am not a pro photographer but an amateur, one keen and serious amateur. I would like to have a place focusing only on photography that I can post my images over there, not like FB, you know. It is too messy with all kinds of marketing and adverts. I am worry that I can't handle and manage the settings. Regarding that, Albert, I haven't been with them that long but I have been very pleased with SmugMug's prompt and clearly stated responses to my cries for help. I too use smugmug and have been generally very pleased. Simple customization is very easy. More complex customization looks somewhat difficult to me, but to be fair, it has been a couple of years since I looked into it, so perhaps they have made it easier. The principle similar competitor seems to be Zenfolio, which I have never used. I also use Flickr as a way to show images in groups, but as a main display, it is not up to smugmug in appearance or features. Once I had the horrifying experience of seeing my captions and other text on smugmug but, my images were not visible! That really scared me because I had put a lot of work into the smugmug images. 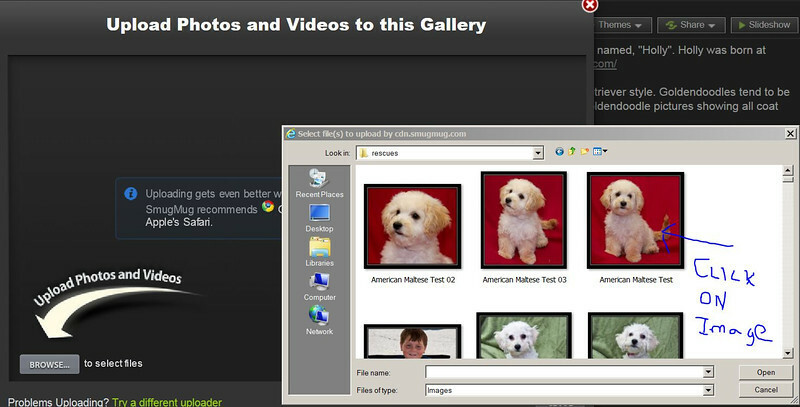 I sent an email to smugmug and received an answer within a few minutes advising me that the problem was not with the smugmug.com site but, with Internet Explorer. The reply email suggested opening smugmug using Mozilla. I did that and there was no problem. That is what I call prompt and efficient customer service. There are three things in digital photography which I like enough to preach about: 1. my 70-200mm f/4L IS lens, 2. The Joe Demb Flash Diffuser Pro (www.dembflash products.com), and 3. www.smugmug.com. Last edited by rpcrowe; 11th January 2013 at 05:11 PM. I preach about those same three things. I don't know whether you use Friedl's LR extension for smugmug, but it is great. Easy and flexible, and it does not leave the jpgs on my computer. TQ so much for your advice on this website hosting. Btw, you mentioned about the Demb Flash Diffuser Pro. I just got mine yesterday and am now practicing with it. You must be using it for quite sometimes, any advice or techniques or special attention you can teach me ? You asked Richard, but I'll throw in an answer while you are waiting for him. I have used the Flip-It for a long time. You can easily play around with one variable that Joe Demb shows on his webiste, which is the angle of the card when you are taking reasonably close up shots of people. I find that the effects are often quite subtle. I've found that I disagree with JD about one thing. That is, he says somewhere that you should use the Flip-It with the flash only straight up, and if you do vertical shots as he shows (by mounting the flip-it on the side and rotating the flash 90 degrees), you have no choice. I have found that that works fine if the subject and background are not too far apart, but when they are, I often want an angled bounce. AFAIK, there are only two options for that. One is to stick with a portrait (horizontal) camera position. The other is to use a bracket that allows you to rotate the entire flash. In the latter case, you can mount the Flip-It on the back of the flash rather than the side and angle the flash as you wish. I sometimes do this, using (ironically?) a Demb flash bracket. However, for my flash work, which is mostly candids at events, the setup with a flash on a bracket and the big Demb reflector standing on the top is quite bulky and awkward, so I often don't use the bracket and limit myself to vertical bounces when the camera is in vertical position. I like Flickr although I have not explored any other services, except briefly. The reason I use Flickr goes to the vast number of groups that post images on different subjects. For example, if I want to see pictures of Deusenberg cars, I find that there are a large number of images to look at. Same for almost any subject...and many, many subjects I have no interest in. My images on old machinery (for example) fits in with many others. There are some nice apps for Flickr that allow you to browse a daily distillation of images or images on anything else on your iPad. That said, I think I will look into using Smugmug (also). I know this thread is old, but I've just found it. I think, the best photography websites are flickr, smugmug and vimeo. But if you want to share your photos, I guess, it is better to create your own online portfolio. Nowadays it is not difficult as there exists a great amount of easy-to-use website builders that don't require special coding skills. Personally I'm going to do this way. I've already found a good collection of online portfolio website builders on http://www.beautifullife.info/web-de...ine-portfolio/ and I'm thinking about using one of them. I hope, this information will be useful for someone! This approach makes a lot of sense for photographers who are looking to sell their work and go through the trouble to buy a domain and create their own commercially oriented website. For a more run of the mill approach, this is not necessary and that is what most photographers prefer. In the past, I used WordPress and later on Wix and am currently working on one using SquareSpace. There are advantages and disadvantages to all of these, but I personally doubt that most members would want to go this route. I think, the best photography websites are flickr, smugmug and vimeo. But if you want to share your photos, I guess, it is better to create your own online portfolio. I'm not plugging for them, but Smugmug does this very well. First, it offers lots of customization, but you don't need to do much if you don't want, as they have quite a number of templates. It's initially more work than uploading to a site like Flickr because you have to learn the tools for controlling the site, and while they aren't complex, it still takes time. Second, it is just great for photo sharing. You have control on a gallery-by-gallery basis. For example, for the galleries that you can see, I use settings that limit the size of a download and disable right-click copying. For private galleries, such as the ones I use for photos of family and friends, I give viewers complete access, since the only people who can see those galleries are the people to whom I give the link. Third, it's routinely backed up. I like smugmug because it is easy to work with. I can share the galleries with whom ever I wish and keep other galleries private. All times are GMT. Page last updated at 04:34 PM.